Dzhokhar Tsarnaev appeared nervous and fidgety as he stood before the men and women who could decide whether he is put to death for allegedly setting off bombs at the Boston Marathon finish line nearly two years ago, killing three people and injuring about 260 others. One survivor - Karen Brassard of New Hampshire, whose husband and daughter were also injured in the bombings - watched the first session of jury selection Monday morning. Monday, Tuesday and Wednesday of this week 1200 prospective jurors have been summoned to federal court in Boston to fill out questionnaires with about 100 questions. Attorneys have a week to go through each group’s questionnaires, confer, and agree on jurors who should be excused “for cause” – like a bias or hardship. Groups of 20 jurors will then be brought back to federal court twice a day starting January 15th or later to be questioned individually as part of the “voir dire” process. Each side has 20 peremptory challenges to use without explanation as they work toward their goal of seating 12 jurors and six alternates. He expects the trial itself to last about three to four months. 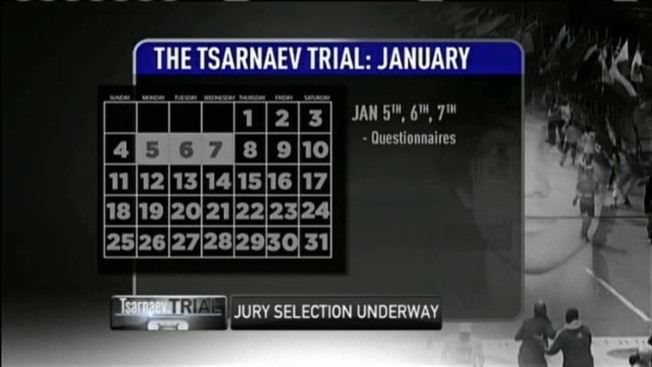 Tsarnaev has pleaded not guilty to the 30 federal charges filed against him.